level of independence, health and dignity. Serving Lake and Mendocino Counties since 1984. 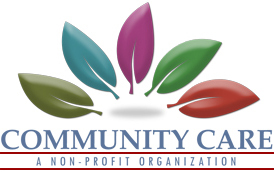 COMMUNITY CARE is a nonprofit agency that arranges affordable, competent help to enable people with disabilities or illnesses continue to live independently at home. Through one of Community Care's programs (see below), a Care Manager will meet with you to discuss your particular situation and to learn about your needs. Working together, we will develop a plan for care in your home. Our staff will arrange the necessary services using community resources or direct purchase. Your Care Manager will follow up with you periodically to make sure the services are working, and to adjust services as your needs change. If you wish, your Care Manager will also keep your family informed of your living situation, even if your family lives far away. There are no fees for most of our services. TO LEARN MORE just drop by or give us a call. We're here to help you (or a loved one) lead a life of independence and dignity. Senior Information and Assistance (I&A) Not sure where to begin? Our Community Resources Specialist will help connect you with the services that may help in your particular situation. Multipurpose Senior Services Program (MSSP) provides social and health care management to assist persons aged 65 and over to remain safely at home. Must be eligible for Medi-Cal and certifiable for skilled nursing care. Community Care Clinical Services are psychotherapy services for individuals with mild to moderate mental health needs. Community Care HIV/AIDS Program (CCHAP) serves individuals diagnosed with HIV or AIDS. Community Care Clearlake Drop-In Center, located at 8050 Lake Street, Suite A, Lower Lake, assists individuals diagnosed with HIV or AIDS. Respite Program, serving the Mendocino coast area, provides help to primary caregivers of persons with developmental disabilities who are clients of the Redwood Coast Regional Center. Independence Plus - The following programs of Independence Plus help Regional Center clients with developmental disabilities (in Ukiah, Willits, and Hopland). The Supported Living Service (SLS) helps individuals with developmental disabilities who are able to live in the community in their own homes and apartments. Supported Living is provided to clients of the Redwood Coast Regional Center. Therapeutic Arts & Performance Studio offers individuals with developmental disabilities the opportunity to express their creativity in various artistic forms. Horizons (Formerly DDASA) helps individuals with developmental disabilities with drug, alcohol, gambling, and other dependencies. Clients are referred by the Redwood Coast Regional Center. Inclusive Senior Services is a day activity service which will integrate Regional Center consumers into the Ukiah Senior Center activities at Bartlett Hall.